You know how it’s time to get out of the water when your fingers turn into prunes? Well, I loved red wine vinegar so much as kid that the only sure way I knew to stop consuming it was when my lips would turn white. Back in the no-fat nineties I used to order oil and vinegar dressing, “hold the oil.” I just could not get enough of the stuff. By the way, If you are interested in learning about more fads from the 1990’s click here. Be prepared that the information is from the perspective of people who were most likely not born until this century. I still enjoy red wine vinegar as much as the next gal, and I am so thankful for the mainstream popularity of salt and vinegar potato chips (Clearly, I am not as opposed to fat as I was back in the day). However, through the years I have branched out with my dressing choices. 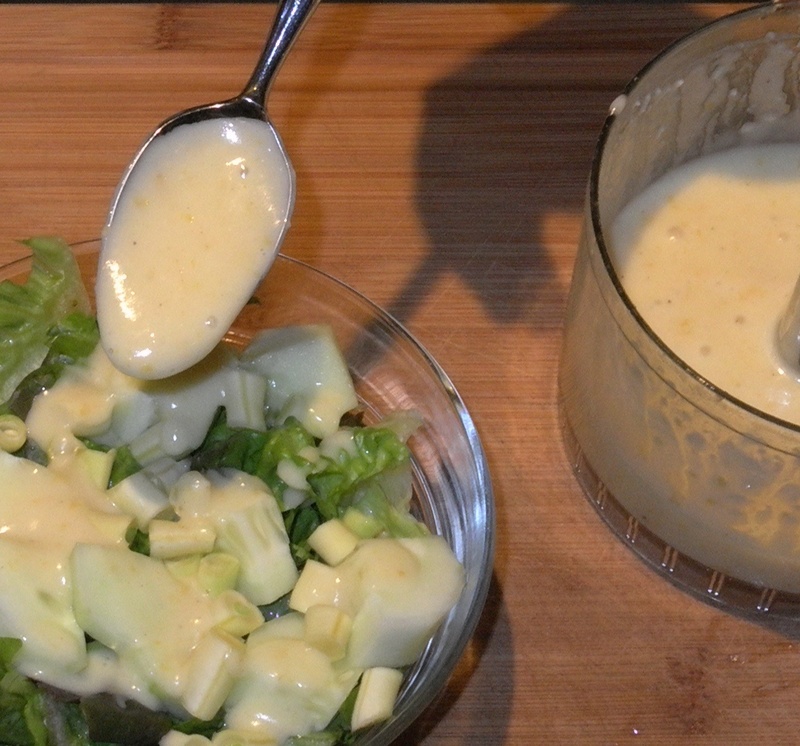 Which brings me to this incredible lemon dressing. It is another winner from Didi Emmon’s Entertaining for Veggie Planet. This dressing is great on a bowl of greens, or you can pretty much put it on top of anything, like tofu or chicken. You can make the whole batch and keep it in the fridge for a week. If you are serving it with greens, be sure to have a good loaf of bread ready…You’ll need something to sop up the extra dressing that gets left in the bowl, and it is not polite to use your finger. In a food processor (if you have s mini one that would work), combine lemon rind and juice, mustard, honey and garlic and process until smooth. With the machine running, slowly add the oil through the feed tube. Season with salt and pepper. These days I am making most of my salads from the vegetables that come from Sang Lee’s CSA. The salad pictured above is made with Red Boston Lettuce, cucumbers, and snap beans. CSA stands for Community Supported Agriculture. Members of a CSA pay in advance for all their produce for the season, and get weekly shipments of fresh food from a local farmer. Our CSA also has cheese and fruit shares; others have meat, eggs, flowers, and more. Its all about what the community wants. Last night was my volunteer shift for the season. There is not much better than spending a beautiful summer evening in a courtyard greeting your neighbors, and ogling fruits and vegetables. 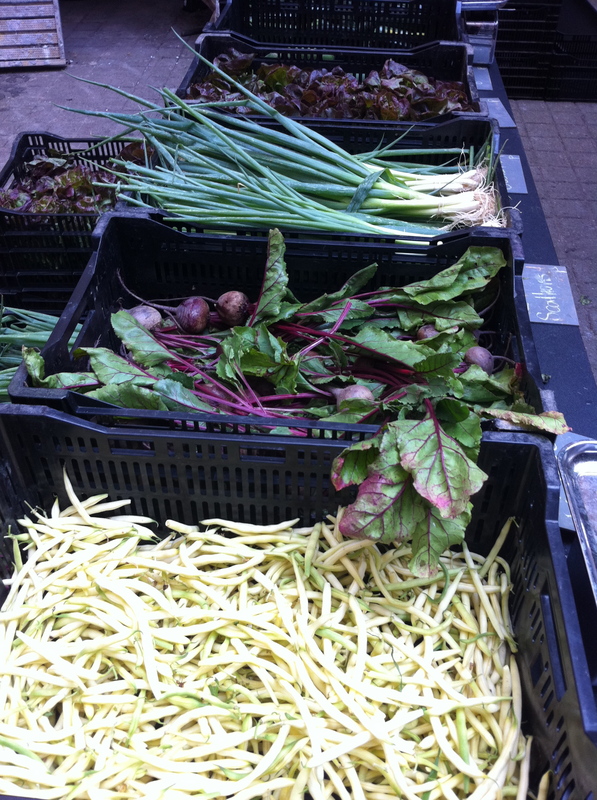 If you are interested in learning more about this particular CSA, click here. If you are interested in learning more about CSAs in general, check out Just Food’s site.